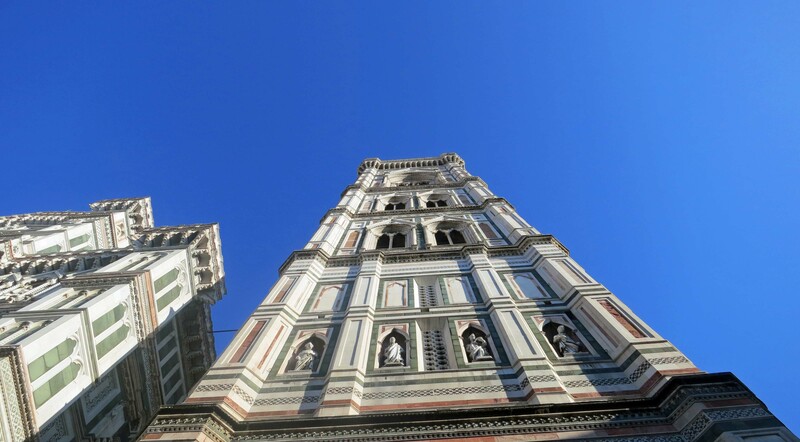 Looking up at the magnificent dome on Florence’s Duomo Cathedral. 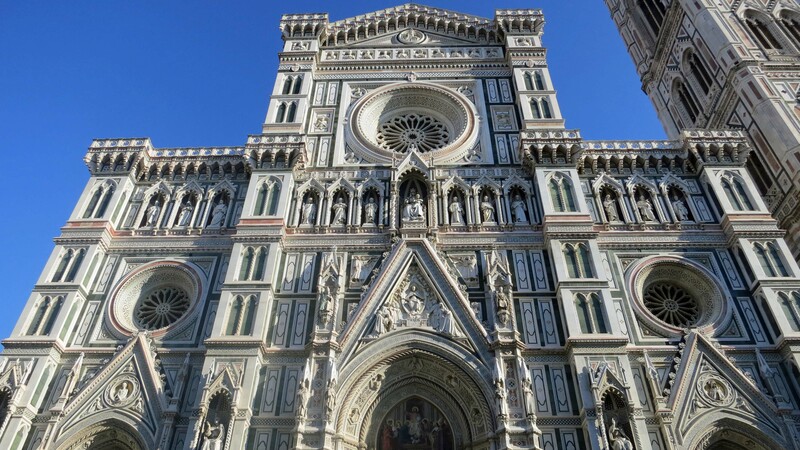 There are three reasons for visiting Florence’s Cathedral, commonly known as the Duomo. 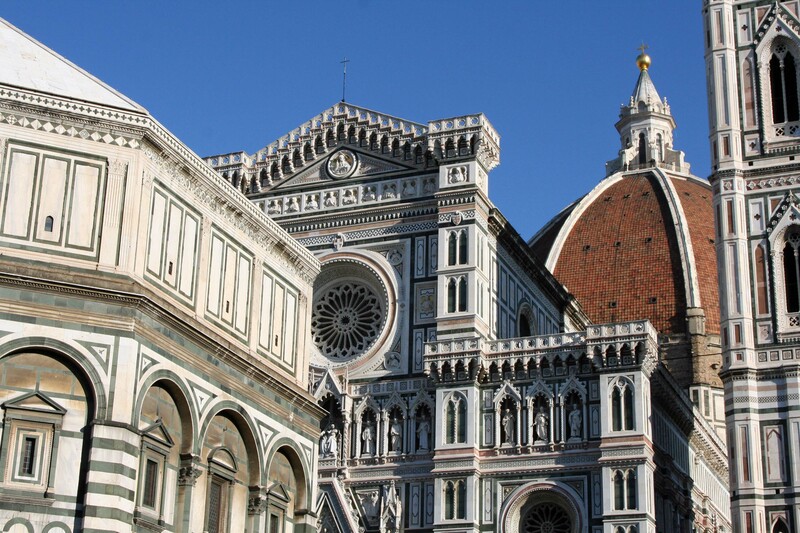 First is the Church itself, second is the magnificent bell tower, which stands next to the church, and third is the octagonal-shaped Baptistery, which stands in front. 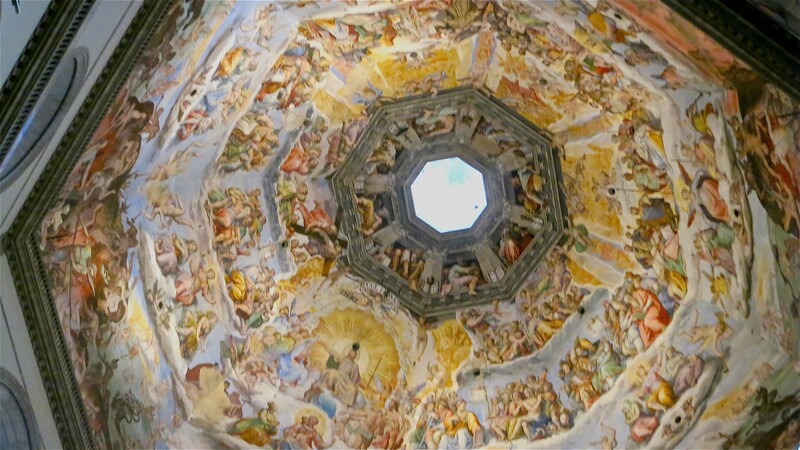 The dome of Duomo was one of the great works of the Renaissance. (The church had been waiting since the Middle Ages for its top.) 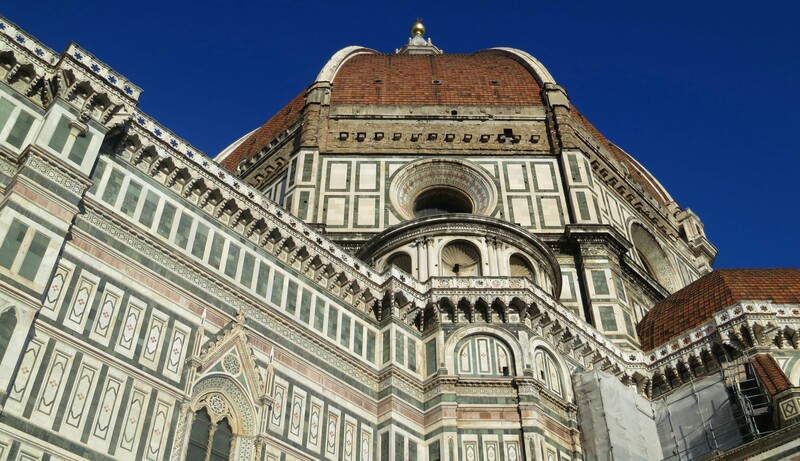 Filippo Brunelleschi, who built the dome, first studied the ancient Pantheon in Rome. Like so much of the Renaissance, the dome represented a return to, or a rebirth of, the great Greek and Roman cultures that had thrived 1000 years earlier before the Dark Ages had arrived along with the Barbarian hordes. Looking up at the Duomo dome from inside the church. 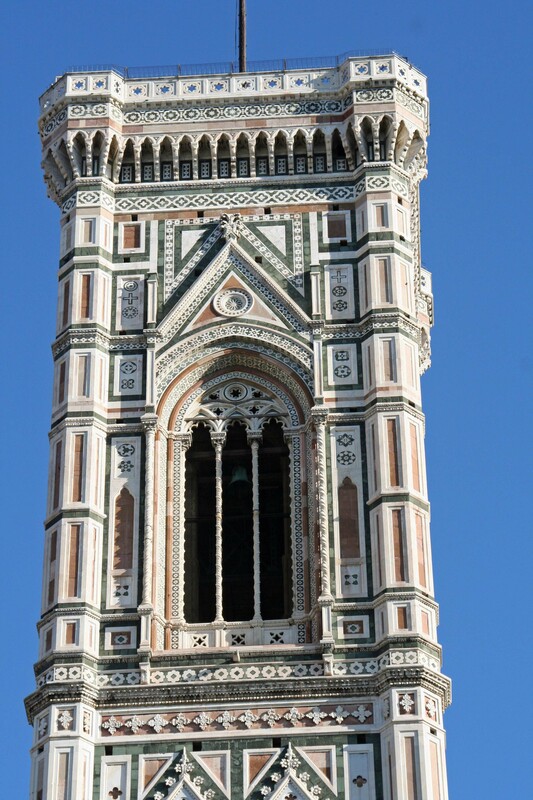 The 270-foot tall Campanile or Giotto’s Tower, which is located next to the Duomo, was actually completed 100 years before Brunelleschi put his finishing touches on the church. Many consider the bell tower to be among the most beautiful in Europe. 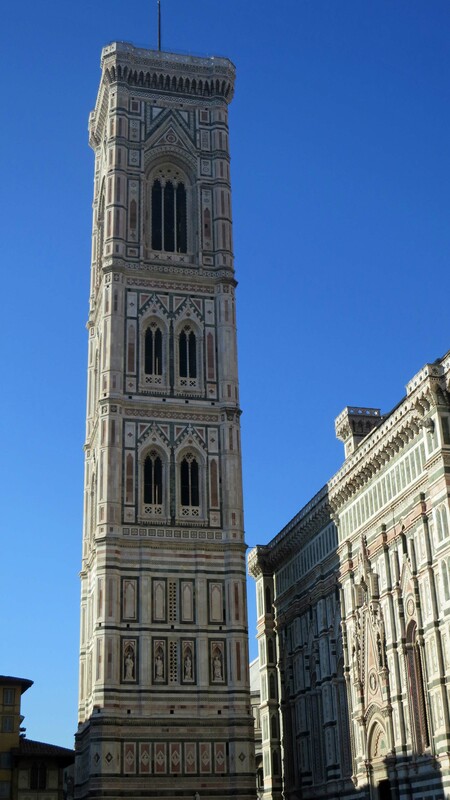 A front view of Giotto’s Bell Tower with the Duomo to the left. 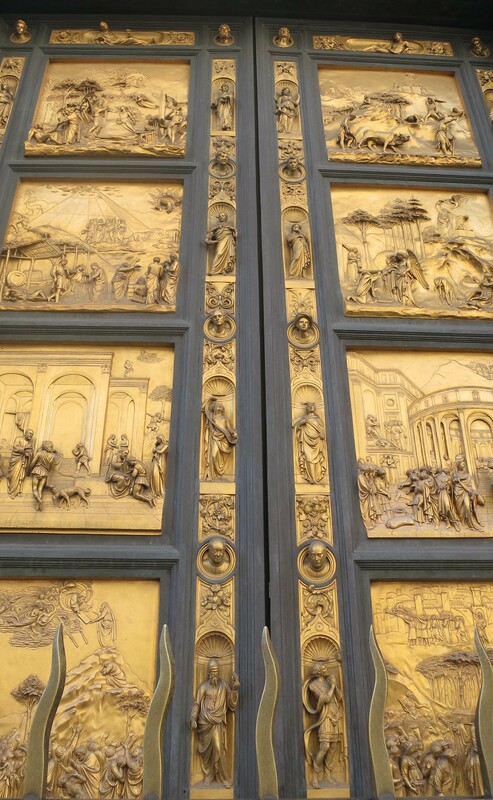 A closer look at the Baptistery Doors. 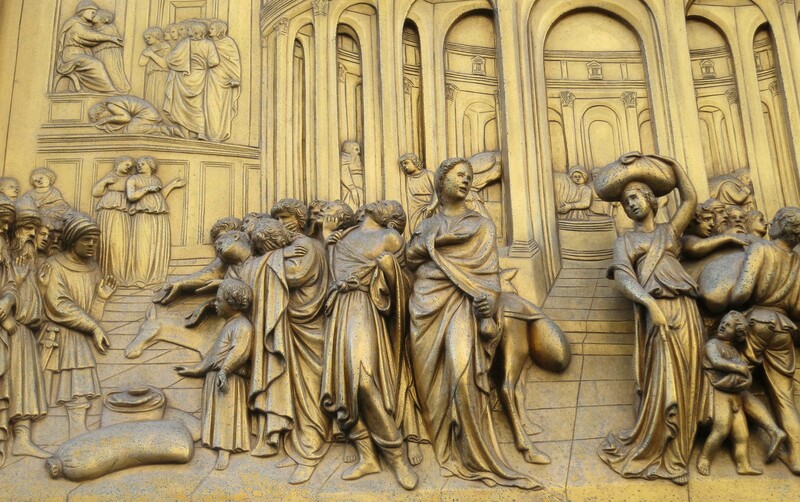 This view of the Baptistery door gives a sense of why Michelangelo spoke so highly of Ghiberti’s work. The Basilica of Santa Croce, a 14th Century Franciscan church, also had some great doors but is better known for the people buried inside including Michelangelo, Machiavelli, Rossini and Galileo. As we stood in front of the church admiring its doors, a man sent bubbles floating into the sky. 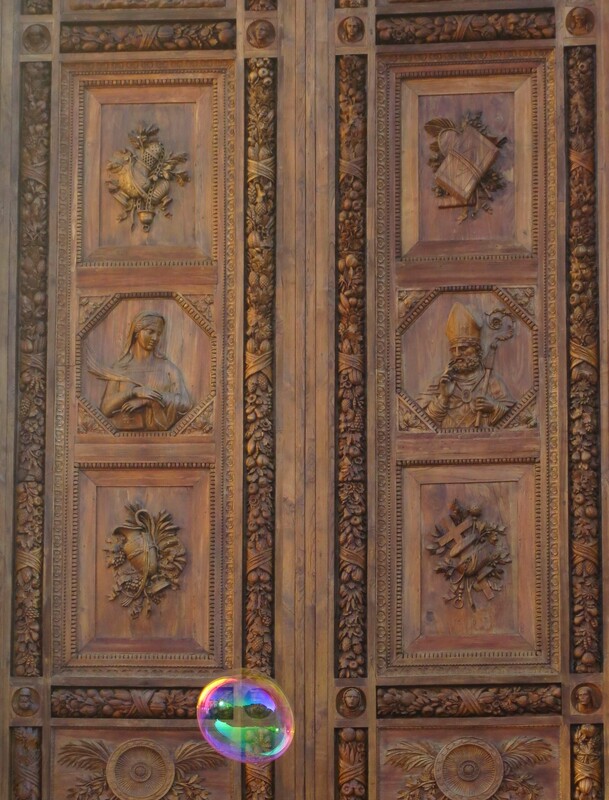 A huge soap-bubble went floating up by the beautiful wooden doors of Santa Croce. 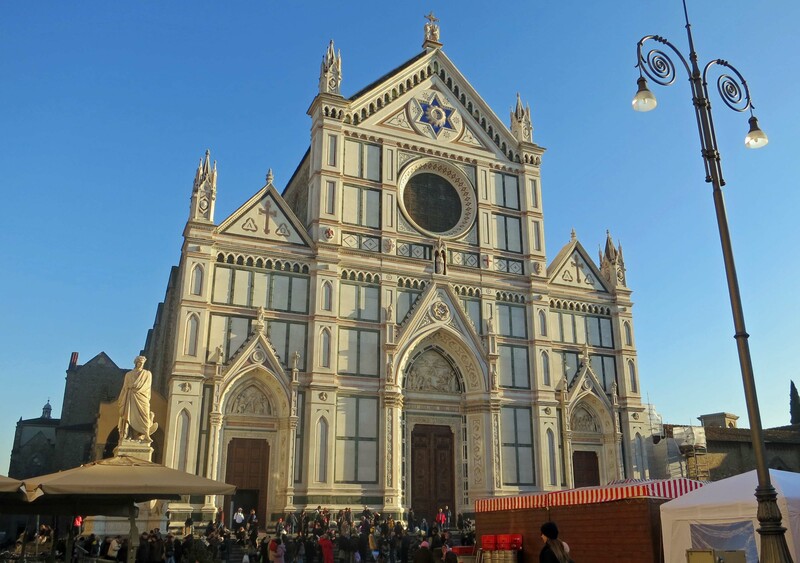 The Basilica of Santa Croce in Florence. NEXT BLOG: While you are reading this blog, Peggy and I are on the scenic Oregon Coast looking for whales. I will feature the trip on my next blog. 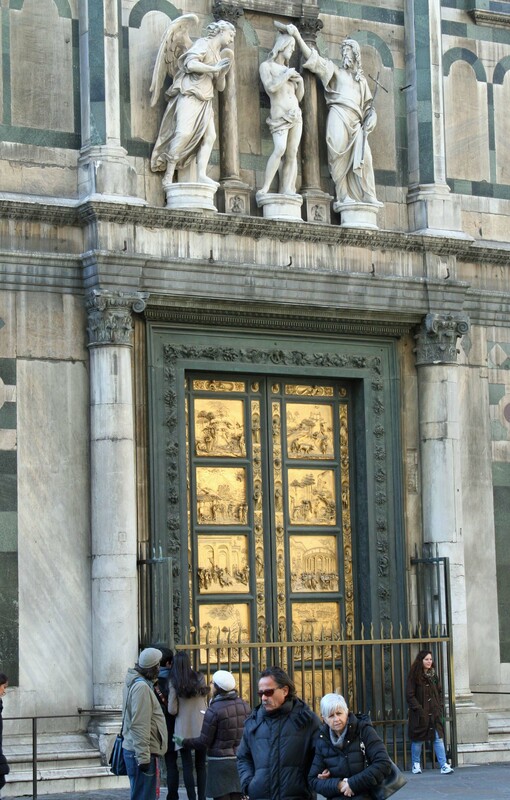 Those Baptistery doors are beyond gorgeous..I really must start saving those quarters for a European vacation and you and Peggy can do an itinerary for me.. One day.. Finally back home and catching up… grin. There was no Internet coverage in the campground. Ouch. It was probably good for me. 🙂 The Net is far too addictive. When Peggy and I took our first year off to travel in 1999, Internet connections were almost nonexistent. We did occasional Emails. What a difference a decade makes in this rapidly accelerating world we live in. And you are right about the Baptistery doors. Unbelievable. When you look at the actual architecture, it is unbelievable that some of it was started perhaps six centuries ago…and it still stands. There must be some erosion – if anything, from pollution or war – but yet, it still stands in all her glory. Imagine the millions of hours human beings toiled to put the stones or bricks into place alone…then consider the artisans who hand-crafted all the beautiful details into the doors, furniture (? – as I am Buddhist) and paintings. Unbelievable. Thanks for sharing. Nice photography as well…Peggy…? Yes, Koji, the craftsmanship and the artistry that went into the churches is incredible. It is impossible not to appreciate the beauty regardless of your religion. (I tend to be more on the eastern side of the equation myself.) And you are right about Peggy. Her photography is always included. A different eye and a different camera helps. I always try to note which photos she takes. The architecture here is jaw-dropping! And those doors! Magnificent.